Telemachus: If You Are A Gen-Xer, Millennial or Anyone Under The Age of 40, You Better Read This. Now. If You Are A Gen-Xer, Millennial or Anyone Under The Age of 40, You Better Read This. Now. We read this stuff so you won't have to. But we hope you will anyway. If you click on the title below, that will take you to the full 134 pages of the CBO Long-Term Budget Outlook document. Go ahead; we dare you to tell anyone that you actually have read every word in this report by next Friday. You will deserve a Congressional Gold Star for your forehead for being such a good student and patriot. If you are just a visual learner and don't want to read all these words and budget jargon, take a look at this slide show and see 26 slides that if they were a Disney Ride, they would probably be called the 'Tower of Terror' because they are so scary. If you just want to breeze through and read the highlights of the highlights (or the 'lowlights of the lowlights'), just skim through the document below we have highlighted in red or blue and be on your merry way. There is a lot of work to do. We need serious citizen-politicians to run and get elected and make these important decisions for the rest of us before it is too late. According to CBO, we just don't know when it may happen but if we let the Debt Hounds from Hades loose, it may be sooner than you would think. Between 2009 and 2012, the federal government recorded the largest budget deficits relative to the size of the economy since 1946, (because of WWII) causing its debt to soar. The total amount of federal debt held by the public is now equivalent to about 74 percent of the economy’s annual output, or gross domestic product (GDP)—a higher percentage than at any point in U.S. history except a brief period around World War II and almost twice the percentage at the end of 2008. If current laws remained generally unchanged in the future, federal debt held by the public would decline slightly relative to GDP over the next few years, CBO projects. After that, however, growing budget deficits would push debt back to and above its current high level. 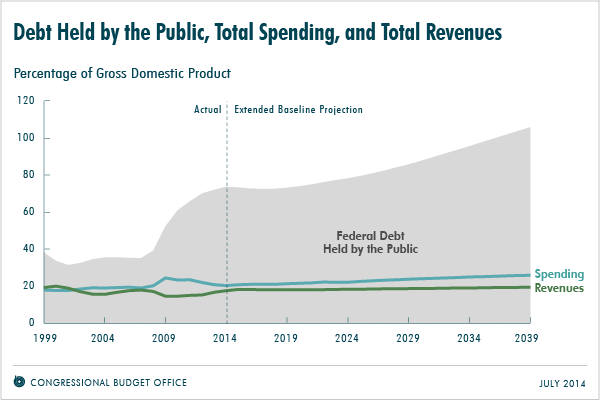 Twenty-five years from now, in 2039, federal debt held by the public would exceed 100 percent of GDP, CBO projects. Moreover, debt would be on an upward path relative to the size of the economy, a trend that could not be sustained indefinitely. What Is the Outlook for the Budget in the Next 10 Years? The economy’s gradual recovery from the 2007–2009 recession, the waning budgetary effects of policies enacted in response to the weak economy, and other changes to tax and spending laws have caused the deficit to shrink this year to its smallest size since 2007: roughly 3 percent of GDP, compared with a peak of almost 10 percent in 2009. If current laws governing taxes and spending stayed generally the same—an assumption that underlies CBO’s 10-year baseline budget projections—the anticipated further strengthening of the economy and constraints on federal spending built into law would keep deficits between 2½ percent and 3 percent of GDP from 2015 through 2018, CBO estimates. In succeeding years, however, deficits would become notably larger under current law. The pressures stemming from an aging population, rising health care costs, and an expansion of federal subsidies for health insurance (Obamacare) would cause spending for some of the largest federal programs to increase relative to GDP. Moreover, CBO expects interest rates to rebound in coming years from their current unusually low levels, raising the government’s interest payments. That additional spending would contribute to larger budget deficits—equaling close to 4 percent of GDP—toward the end of the 10-year period spanned by the baseline, CBO anticipates. Altogether, deficits during that 2015–2024 period would total about $7.6 trillion. With deficits expected to remain close to their current percentage of GDP for the next few years, federal debt held by the public is projected to stay between 72 percent and 74 percent of GDP from 2015 through 2020. Thereafter, larger deficits would boost debt to 78 percent of GDP by the end of 2024. What Is the Outlook for the Budget in the Long Term? CBO has extrapolated its baseline projections through 2039 (and, with even greater uncertainty, through later decades) by producing an extended baseline that generally reflects current law. The extended baseline projections show a substantial imbalance in the federal budget over the long term, with revenues falling well short of spending (see the figure below). As a result, budget deficits are projected to rise steadily and, by 2039, to push federal debt held by the public up to a percentage of GDP seen only once before in U.S. history (just after World War II). The harm that such growing debt would cause to the economy is not factored into CBO’s detailed long-term projections but is considered in further analysis presented in this report. The government’s net interest payments would grow to 4½ percent of GDP by 2039, compared with an average of 2 percent over the past four decades. Net interest payments would be larger than that average mainly because federal debt would be much larger. After 2024, revenues would increase gradually relative to GDP under the assumptions of the extended baseline, mainly because people’s income is expected to grow faster than the rate of inflation, pushing more income into higher tax brackets over time. The gap between federal spending and revenues would widen after 2015 under the assumptions of the extended baseline, CBO projects. By 2039, the deficit would equal 6½ percent of GDP, larger than in any year between 1947 and 2008, and federal debt held by the public would reach 106 percent of GDP, more than in any year except 1946—even without factoring in the economic effects of growing debt. Moreover, the harmful effects that such large debt would have on the economy would worsen the budget outlook. Under current law, the increase in debt relative to the size of the economy, combined with a gradual increase in marginal tax rates (the rates that would apply to an additional dollar of income), would reduce economic output and raise interest rates, compared with the benchmark economic projections that CBO used in producing the extended baseline. Those economic effects in turn would lead to lower federal revenues and higher interest payments on the debt. With those effects included, federal debt held by the public under the extended baseline would rise to 111 percent of GDP in 2039. Beyond the next 25 years, the pressures caused by rising budget deficits and debt would become even greater unless laws governing taxes and spending were changed. With deficits as big as the ones that CBO projects, federal debt would be growing faster than GDP, a path that would ultimately be unsustainable. What Consequences Would a Large and Growing Federal Debt Have? How long the nation could sustain such growth in federal debt is impossible to predict with any confidence. 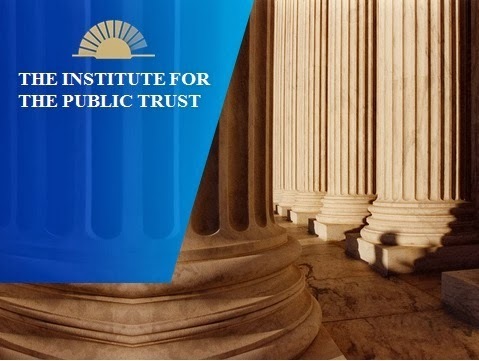 Federal spending on interest payments would rise, thus requiring higher taxes, lower spending for benefits and services, or both to achieve any chosen targets for budget deficits and debt. What Effects Would Alternative Fiscal Policies Have? Most of the projections in this report are based on the assumption that laws governing federal taxes and spending will remain generally the same over time—not because CBO expects that to occur but because the budgetary and economic implications of current law are a useful benchmark for policymakers when they consider changing laws. If tax and spending policies differed significantly from those specified in current law, budgetary and economic outcomes could differ substantially as well. To illustrate some possible differences, CBO analyzed the effects of three additional sets of fiscal policies. Under one set of alternative policies (1)—referred to as the extended alternative fiscal scenario—certain policies that are now in place but are scheduled to change under current law would be continued, and some provisions of law that might be difficult to sustain for a long period would be modified. With those changes to current law, deficits excluding interest payments would be about $2 trillion higher over the next decade than in CBO’s baseline; in subsequent years, such deficits would exceed those projected in the extended baseline by rapidly growing amounts. The harmful effects on the economy from the resulting increase in federal debt would be partly offset by the lower marginal tax rates that would be in place under that scenario. Nevertheless, in the long term, economic output would be lower and interest rates would be higher under that set of policies than under the extended baseline. With those economic changes incorporated, federal debt held by the public would exceed 180 percent of GDP in 2039, CBO projects. Under a different scenario (2), budget deficits would be smaller than those projected under current law: Deficit reduction would be phased in such that deficits excluding interest payments would be a total of $2 trillion lower through 2024 than in CBO’s baseline, and the amount of deficit reduction as a percentage of GDP in 2024 would be continued in later years. In that case, output would be higher and interest rates would be lower in the long term than under the extended baseline. Factoring in the effects of those economic changes on the budget, CBO projects that federal debt held by the public would equal about 75 percent of GDP in 2039, close to its percentage in 2013. Under yet another scenario (3), with twice as much deficit reduction—a total decrease of $4 trillion in deficits excluding interest payments through 2024—CBO projects that federal debt held by the public would fall to 42 percent of GDP in 2039. That percentage would be slightly above the ratio of debt to GDP in 2008 and the average ratio over the past 40 years (both 39 percent). As in the preceding scenario, output would be higher and interest rates would be lower in the long term than under the extended baseline. Such alternative fiscal policies would have differing effects on the economy in the short term as well as in the long term, reflecting the short-term impact of tax and spending policies on the demand for goods and services. The spending increases and tax reductions in the alternative fiscal scenario (relative to what would happen under current law) would increase the demand for goods and services and thereby raise output and employment in the next few years. The deficit reduction under the other scenarios, by contrast, would decrease the demand for goods and services and thus reduce output and employment in the next few years. How Uncertain Are the Long-Term Budget Projections? 1) In cases in which only one of those factors varies from the values used for the extended baseline, CBO’s projections of federal debt held by the public in 2039 range from about 90 percent of GDP to 135 percent, compared with 111 percent under the extended baseline including the economic effects of future fiscal policies. 2) In a case in which all four factors vary simultaneously in a way that raises projected deficits, but they vary only half as much as in the individual cases, federal debt is projected to reach about 160 percent of GDP in 2039. 3) Conversely, in a case in which all four factors vary in a way that lowers deficits but, again, vary by only half as much as in the individual cases, debt in 2039 is projected to equal 75 percent of GDP, about what it is now. Those calculations do not cover the full range of possible outcomes, nor do they address other sources of uncertainty in the budget projections, such as the risk of an economic depression or major war or the possibility of unexpected changes in birth rates, immigration, or labor force participation. Nonetheless, CBO’s analysis shows that the main implication of the central estimates in this report applies under a wide range of possible values for some key factors that influence federal spending and revenues. That implication is that if current laws remained generally unchanged, federal debt, which is already high by historical standards, would be at least as high and probably much higher 25 years from now. What Choices Do Policymakers Have? 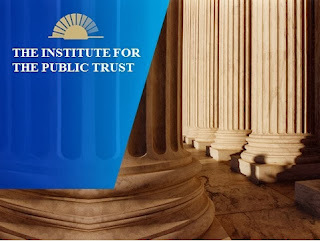 The unsustainable nature of the federal tax and spending policies specified in current law presents lawmakers and the public with difficult choices. 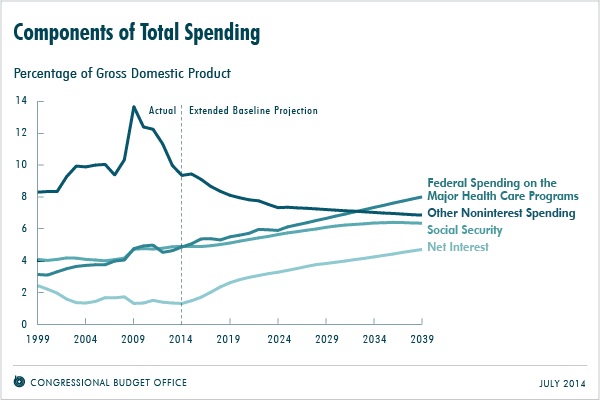 Unless substantial changes are made to the major health care programs and Social Security, spending for those programs will equal a much larger percentage of GDP in the future than it has in the past. At the same time, under current law, spending for all other federal benefits and services would be on track to make up a smaller percentage of GDP by 2024 than at any point in more than 70 years. Federal revenues would also represent a larger percentage of GDP in the future than they have, on average, in the past few decades. Even so, spending would soon start to outpace revenues by increasing amounts (relative to GDP), generating rising budget deficits. As a result, federal debt held by the public is projected to grow faster than the economy starting a few years from now, and because debt is already unusually high relative to GDP, further increases could be especially harmful. To put the federal budget on a sustainable path for the long term, lawmakers would have to make significant changes to tax and spending policies: reducing spending for large benefit programs below the projected levels, letting revenues rise more than they would under current law, or adopting some combination of those approaches. The size of such changes would depend on the amount of federal debt that lawmakers considered appropriate. For example, lawmakers might set a goal of bringing debt held by the public back down to the average percentage of GDP seen over the past 40 years—39 percent. 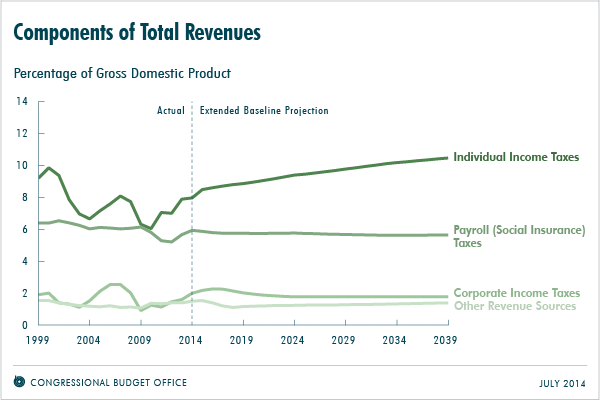 Meeting that goal by 2039 would require a combination of increases in revenues and cuts in noninterest spending, relative to current law, totaling 2.6 percent of GDP in each year beginning in 2015 (without accounting for the economic effects of the reduction in debt or of the policy changes that might be used to achieve it); in 2015, 2.6 percent of GDP would equal about $465 billion. If those changes came entirely from revenues, they would represent an increase of 14 percent from the revenues projected for the 2015–2039 period under the extended baseline. If the changes came entirely from noninterest spending, they would represent a cut of 13 percent from the amount of noninterest spending projected for that period. A similar level of debt in 2039 would result under the third scenario discussed above (a $4 trillion total reduction in deficits excluding interest payments through 2024, with the amount of deficit reduction in 2024 as a percentage of GDP continuing in later years). The sooner significant deficit reduction was implemented, the smaller the government’s accumulated debt would be, the smaller policy changes would need to be to achieve a particular long-term outcome, and the less uncertainty there would be about what policies would be adopted. However, if lawmakers implemented spending cuts or tax increases quickly, people would have little time to plan and adjust to the policy changes, and those changes would weaken the economic expansion during the next few years. Reductions in federal spending or increases in taxes that were implemented several years from now would have a smaller effect on output and employment in the short term. However, waiting for some time before reducing federal spending or increasing taxes would result in a greater accumulation of debt, which would represent a greater drag on output and income in the long term and would increase the size of the policy changes needed to reach any chosen target for debt. If lawmakers wanted to minimize both the short-term economic costs of reducing deficits quickly and the longer-term costs of running large deficits, they could enact a combination of changes in tax and spending policies that increased the deficit in the next few years relative to what it would be under current law but reduced the deficit thereafter. Even if policy changes to shrink deficits in the long term were not implemented for several years, making decisions about them sooner rather than later would offer significant advantages. If decisions were reached sooner, people would have more time to alter their behavior to be prepared for the time when the changes would be carried out. In addition, decisions about policy changes that would reduce future debt relative to the amounts projected under current law would tend to increase output and employment in the next few years by holding down longer-term interest rates, reducing uncertainty, and enhancing businesses’ and consumers’ confidence.